English Folk Art? Any help is appreciated. Any information in regards to this piece is appreciated. Maybe the artist is "Talor"?? The muscles on the horse look exaggerated. I don't know if this is amazing or just amateurish. The frame is quite nice So why waste a good frame on rubbish? It is oil on board. It measures 9x11 with the frame. Aya, I think that it is a very nice English "genre" piece. One of their very well known artists of horses is Stubbs but this is not he. 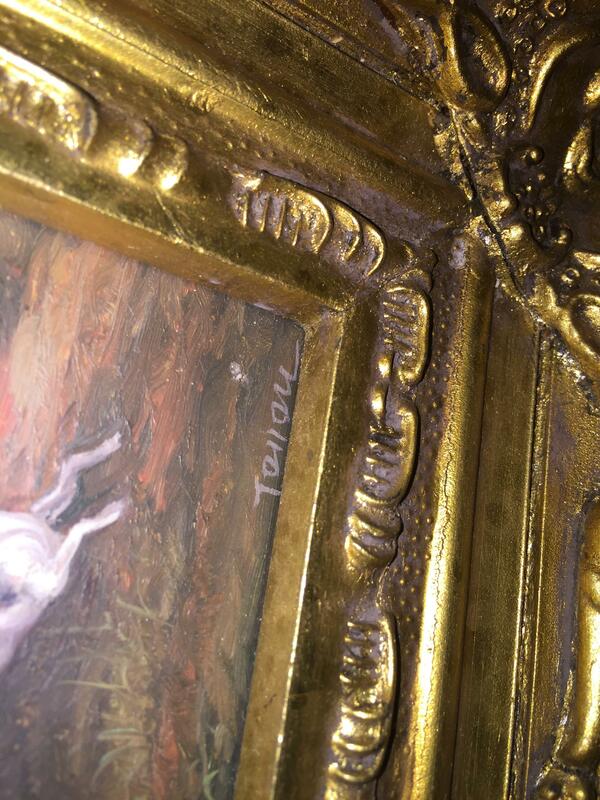 Could you take it out of the frame to see if the signature is more clear and if any other clue is hidden beneath? Now, I can not tell, for instance, if their are 2 "L"s in the middle or a "y"; can't see the way the letters are connected, so can't tell an "e" from an "a", etc. I'd like to research it some for you a little later. Hi trover, thanks so much for the insight. I can't take it out of the frame without tearing the paper on the back. I took another pic from a different angle with the flash. Hopefully that helps. Hi! It looks to me like it might possibly be an overpainted print. I have seen a lot of those and they are very well done and often put into really ornate frames. Can you send a close-up image? Does it look like there could be printing under the paint? The signature is partially hidden under the frame. 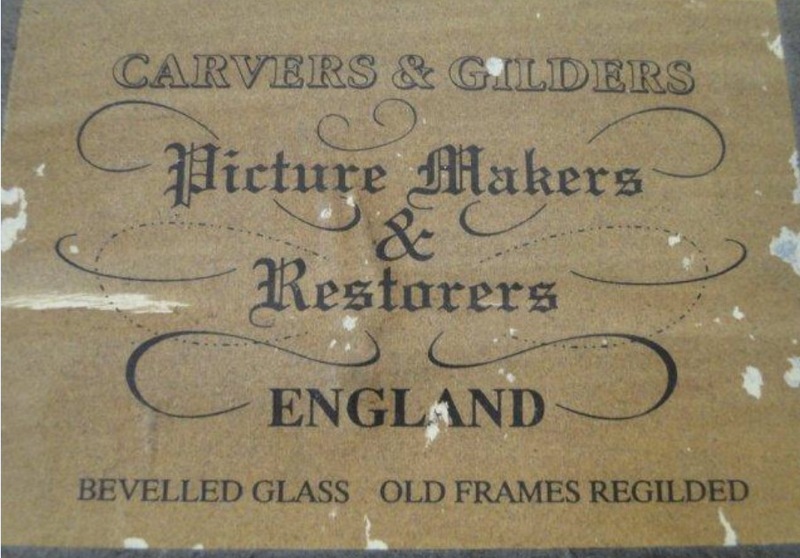 If the only info on the back of the frame is the framer's info then I would be tempted to tear it off and get the painting out to have a closer look! I'm thinking the tag is your best way to approach this one. Its obviously in a wonderful frame and the style makes it look Georgian, The restorers have marks somewhere on the piece that can identify it for you. Contact them. Its not folk art, its fine art. I think the magnification of the photo is misleading to your conclusion. It looks like live paint to me. The signature is the only thing that looks a little 'off'. » English Folk Art? Any help is appreciated.